Matt Siegle. “Arroyo Seco Bedding Spoon,” 2015. Installation view. Matt Siegle. “New Model Heaton Flats Domicile,” 2015. Installation view. Matt Siegle. “19th-century study/Eddie,” 2014. Installation view. “Eddie’s Gulch,” a new show by Matt Siegle at Los Angeles’s Park View Gallery, centers on the fictional “Eddie,” a figure living in a homeless village along the San Gabriel River. The exhibit of painting and sculpture is a record of traces, vestiges of life carried out on the periphery of urbanity, the elusive contrails of those who prefer to remain hidden and free. The sense of trespass is heightened at Park View, an apartment gallery that has viewers peering into bathrooms and closets, where the distinction between public and private is just as hazy as in the encampments. Drawing on influences such as Maynard Dixon, Edouard Manet, and the Hudson River School, Siegle simultaneously invokes and deconstructs the traditions of portraiture and landscape painting. 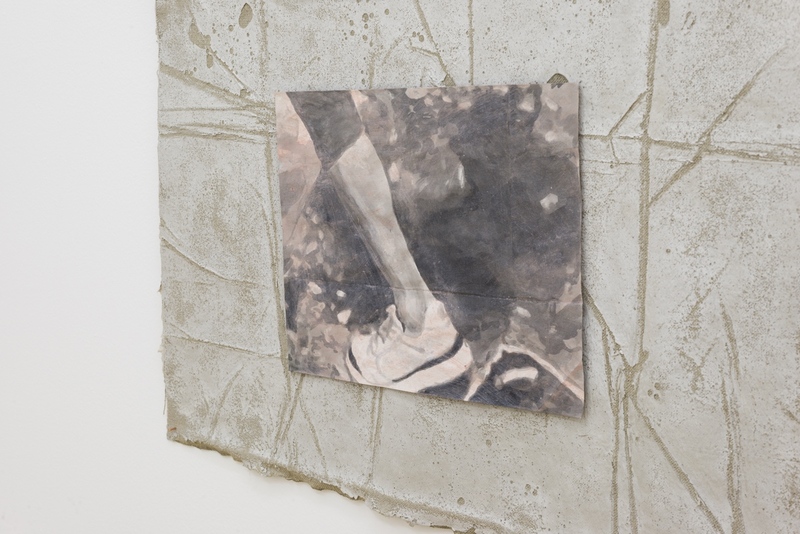 He presents these encampments as complex ecologies, elaborate assemblages of the bodily, the material, and the natural. The gulch evades conventional aesthetic categories. It is neither the subdued pastoral nor the terrible sublime; it offers neither nostalgic comfort nor soul-cleansing purification. Rather than represent a return to primitive nature free of human artifice, this landscape is deeply enmeshed within the man-made — both wild and engineered at once. It is a landscape of dust, concrete, succulents, old REI gear, and sun. Matt Siegle. “I wear denim and soiled ripstop. In the canyon I sport white athletic socks, hiking boots bought used from REI parking lot sale–no, cheapo Reeboks actually. My t- shirt shaded gray and with lightly brassy pit stains. The sweat collects at my hairline at the top of my head. Drips the SPF 30 off the tip of my nose. Chem-UVA- UVB droplets collecting on my chest hair, slithering down my core and abdomen and each notch of my spine. With every passing sun- minute my cotton shirt clings to my torso, closely now. The shirt darkening with perspiration, through the weave of the belt and soaking the 501s, dampens my athletic compression shorts, quads, junk, grime.” 2014. Close-up view. The ad hoc settlements, exhibiting an apocalyptic utilitarianism, are the products of both desperation and autonomy. Though some might see these encampments as social failures, they also exploit the cracks within the system to create new possibilities for living. From the crude castoffs of consumer culture, between the neglected folds of society, they constitute a world apart, however pro tempore. (Authorities regularly break down the homeless villages, only to have them spring back up again.) And Siegle draws inspiration from their makeshift tools: In Arroyo Seco Bedding Spoon, nylon camouflage sheets lie wadded up in the center of the room off the kitchen. The New Model Heaton Flats Domicile features a camping tent stripped down to its formal elements, a piece of foliage dangling from the smooth parabola of the poles. The provisional nature of these habitats, with their capacity for both invention and risk, provide an apt metaphor for the shaky circumstances of late capitalism itself, as the environment collapses, debts accumulate, and social safety nets disappear. In the so-called flexible economy, modern life is primarily one of improvisation and assemblage. Harkening back to California’s early capitalist history, Siegle calls the squatters “present-day day gold mining drifters,” recasting them as American folk heroes. And like those early gold-miners, whose fortunes depended upon the caprices of economic speculation, squatters like Eddie are also crucibles of a precarious future. And yet, the dream of striking gold, and with it the promise of a shining tomorrow, is thoroughly undone here: “Maybe it’s gold, but Eddie says more likely your own nostalgia,” Siegle writes in one of his painting’s 100-word long titles. Eddie squats down by the river. Wal-Mart Reeboks toe-dipping in the water, back shining in the afternoon sun. We watch from above, silently now. The tributary winds a course past the succulents, the trash, the boulders and the Occitillo plant, covers the base of the milk crate, weaves through the plastic grating, buffs the grit. And a hand grabs your shoulder. Hot breath on my eyelids. Long hair brushing my forehead. Musk on my earlobes, meth teeth on my nose: growling, let’s get outta here. Rolling onto the stomach now: slide down the wet dirt and tumbled rocks in the dark; crushing ant hills and hiker cairns; slithering into the icy river; dissolving into pebbles; pebbles sifting through more rough hands; hands wiping and grabbing, swatting flies, laying tarp, setting up the tent in the shade of the black oak. Rather than name — and thus fix — the subject as in traditional portraiture, the titles function as interpretive accompaniments, phenomenological descriptions that court the carnal. The literary equivalents of the close-up, the titles are rife with somatic detail yet never lay out the whole picture, never aspire towards the kind of descriptive mastery that would render the subject entirely knowable. The monochromatic paintings, based on photographs Siegle took over the past two years, appear as if they were glimpsed through the brush by surveillance camera, or beamed down from Mars. Social realism, à la Dixon, is not the object. 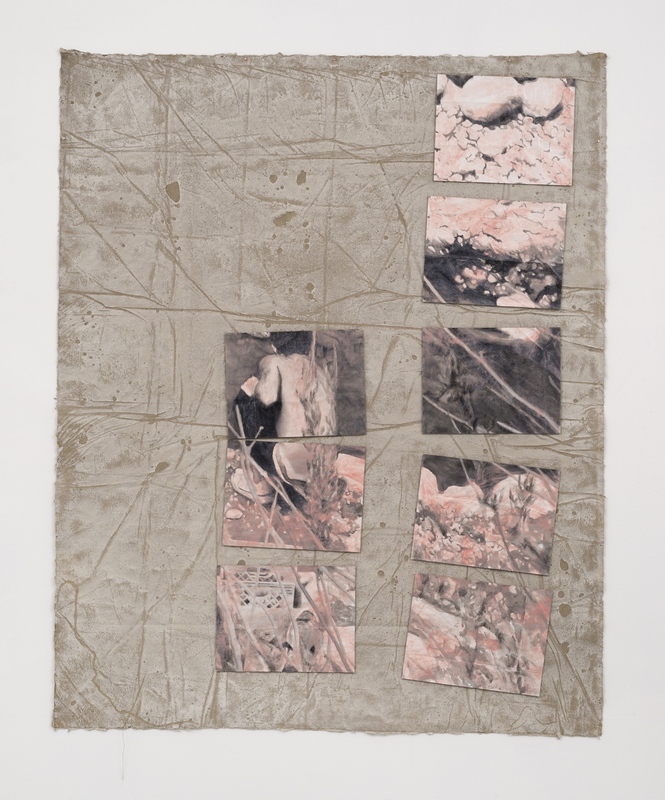 The images are presented in fragments, unevenly arranged on ragged squares of recycled shopping bags whose surfaces have been plasticized and mounted on linen. Traces of dissolved acrylic on the canvas, formed through an evaporative process, recall the cracks and ridges of the desert floor. Bodies and objects, pieces of narrative, are fleeting and obscured. A sneakered foot, a milk crate, a crouched figure — these emerge in rare flashes among the wavering depictions of rocks and chaparral. Poised on the precipice of abstraction, the subjects of these paintings seem almost temporary, contourless, on the verge of flight — as if a sudden noise might dissolve them from view. Traditional 19th century American landscape painting was informed by the idea of Manifest Destiny, that westward expansion was driven by divine mandate and progress could be measured by acreage claimed. Many of these paintings strove towards an all-encompassing vision that took possession of the land through the act of representation. But, in Siegle’s work, what cannot be seen is just as important as what is. Far from offering an omniscient and comprehensive view, these illustrations are abstract, fragmented and indexical — except for perhaps one. Hanging above the gallery’s toilet, placed so that the viewer must crane around the bathroom door to see, is a portrait entitled 19th-century study/Eddie. Painted in a rough, loose style, the figure looks away. We see the side of a face, covered by a hat and beard, wreathed in shadow. It is the closest we come to accessing the mythic Eddie, his hungers and all he might represent, and yet our view is obstructed. Eddie, his gaze averted, remains a mystery. Images courtesy of Park View Gallery.